Kate Fitzgerald’s parents today said they were “deeply hurt” by how the newspaper handled an article written by their daughter before she took her own life. THE EDITOR OF the Irish Times has said the newspaper “deeply regrets” any hurt caused to the family and friends of Kate Fitzgerald by the actions of the paper. Kevin O’Sullivan’s comments came as Kate Fitzgerald’s parents criticised the paper for how it handled an article written by the 25-year-old before she took her own life in August. In an article published on its website tonight, O’Sullivan said that the newspaper’s “sole aim” had been “to focus on an important issue for people with mental illness”. The article says that the Irish Times’s subsequent decision to edit Kate Fitzgerald’s article and then publish an apology “was necessary in the context of fairness”. The article says that O’Sullivan made his comments yesterday – before the Fitzgeralds made public their unhappiness with the paper’s actions. Kate Fitzgerald’s parents met with senior Irish Times staff earlier this week, including the editor and deputy editor. The couple said today that they were “deeply hurt” by the insensitivity of the paper. In a piece published on Broadsheet website, Tom and Sally Fitzgerald said that the paper had “butchered” their daughter’s article. “We are deeply hurt by the insensitivity of the Irish Times and its inability to grasp how its position has compounded our grief, and attempted to stilt the national debate on depression and suicide,” the couple said in the article. The parents of the 25-year-old writer and PR consultant said that they “stand behind” Kate’s article. Kate Fitzgerald wrote an anonymous opinion piece for the newspaper about her depression, detailing her experience of workplace reaction to mental health issues. She had taken her own life before the article was published on 9 September. The newspaper published a major article about Kate’s life on 26 November, written by senior editor Peter Murtagh. The online version of Kate Fitzgerald’s article was subsequently edited. Seven days after it had been published, the newspaper published a apology on 3 December saying that “significant assertions within the original piece were not factual”. Email “Irish Times responds to criticism from parents of Kate Fitzgerald”. 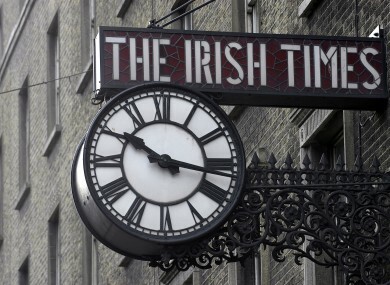 Feedback on “Irish Times responds to criticism from parents of Kate Fitzgerald”.